This salad is simple but sounds fancy and tastes unbelievably good. I’m not sure where I got the original idea, but I’m sure it was some celebrity chef. Below is my own recipe. I’ve broken the recipe down for each ingredient. I recommend prepping the goat cheese first and while it’s chilling make the crostini and vinaigrette. 1-Make sure your goat cheese is cold and remove from package. Cut goat cheese in ¼ inch thick slices. Should get 8 per log. 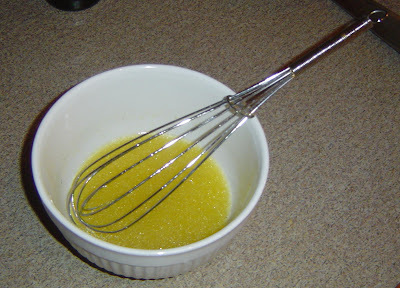 2-Whisk your egg in a shallow dish. 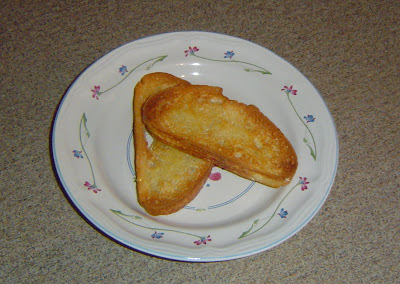 Place ¼ cup of bread crumbs on a shallow dish or plate. 3-Take each slice and coat in egg and then bread crumbs. Place on a separate plate and refrigerate for 15 minutes to an hour. 4- (This last step should be done right before assembling the salad) In a sauté pan heat a couple of tablespoons of EVOO over medium-high heat. Once pan is hot enough, add chilled goat cheese and pan fry for about 1 minute on each side. This will toast the bread crumbs but keep the cheese from melting. 1- Juice three lemons into a deep bowl. Remove any seeds. 2- Add two tablespoons of white wine vinegar and a very small (half teaspoon) of honey. 3- Add salt and pepper. 4- While whisking the mixture, stream in ¼ cup of EVOO. 1- Slice bread ¼ inch thick and layer on a baking sheet. 2 slices per person. 2- Drizzle lightly with EVOO. 3- Broil on low in oven until crisp and golden brown. Should take about 5 minutes. 4- Remove from oven and rub each slice with garlic clove. Assembly1- Place two crostini on a plate per person. 2- In a large bowl toss mesclun with S&P and a small amount of Lemon Vinaigrette. Don’t drown the mesclun – just enough to coat it. You’ll have a good amount leftover for other uses. Or you could serve on the side if anyone wants to add more. 3- Place about one cup of mesclun greens on top of crostini. 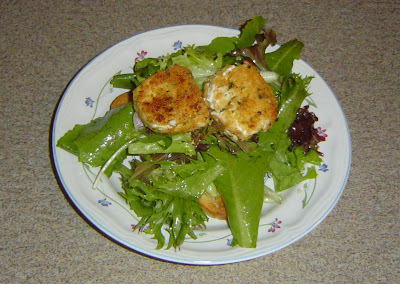 4- Place two pieces of warmed goat cheese on top of each salad and serve. My thoughts: Everything in this salad just plays really well off the other ingredients. Nothing overwhelms the other. The honey in the vinaigrette mellows out the tartness enough without losing the lemon flavor or making the vinaigrette sweet. The crostini adds the salad a nice crunch and adds just a hint of garlic. And honestly, what’s not to love about goat cheese? Tangy and creamy and just slightly melty from being pan fried. Simply fantastic!